The gene-editing company announced a big stock offering. Shares of CRISPR gene-editing biopharma Intellia Therapeutics (NASDAQ:NTLA) dropped nearly 18% today after the company announced a major public share offering to increase its cash balance. The biopharma will offer 6.25 million shares, with the option to purchase an additional 937,500 shares, at $24 apiece. The good news is that the share offering will provide gross proceeds of up to $170 million. The bad news is that the share offering will dilute existing shareholders by up to 20%. Overall, this was a great move by management. As of 11:56 a.m. EDT, the stock had settled to a 15.2% loss. There are three ways for preclinical biopharma companies to raise money after their IPO: deep-pocketed partners, debt financing, or share offerings. The last route is the most common. While overusing the financial tool can destroy shareholder value, it also offers the most control and flexibility. For instance, it can be completed quickly to opportunistically take advantage of a soaring stock price -- and that's exactly what Intellia Therapeutics management did here. The transaction will boost its cash balance by at least $150 million. It may seem unnecessary, especially when considering Intellia Therapeutics ended September with $222 million in cash, but the war chest will come in handy as it ramps up research and development activities and moves closer to its first clinical trials. Dilution is never welcomed by shareholders, but it's a necessary evil in early-stage biopharma investing. 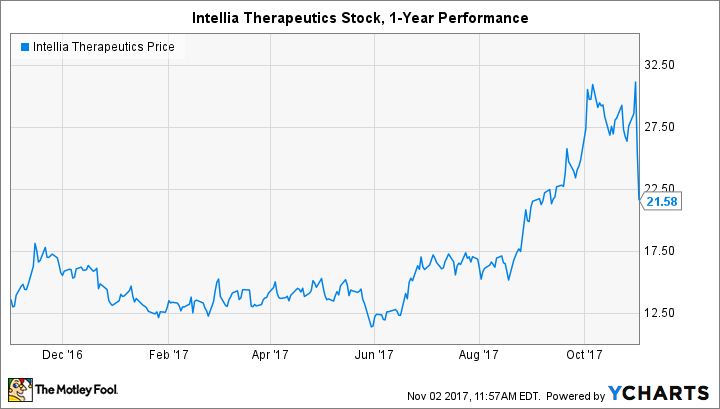 Investors should find some comfort in the fact that Intellia Therapeutics management offered shares opportunistically to take advantage of a booming stock price. Of course, while the company is likely to end 2017 with nearly $350 million in cash, it will need much more in the long term to develop its pipeline.